Adrien Hébert’s artistic career may be said to have begun in 1909 when he exhibited for the first time at the AAM’s Salon du printemps, a venue that regularly featured his works up until 1954. From 1910 to 1960 his paintings were shown at the annual exhibitions of the Royal Canadian Academy of Arts. 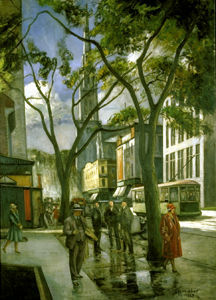 1927 by Adrien Hebert, oil on canvas (courtesy Musée du Québec). Adrien Hébert, painter (b at Paris, 12 April 1890; d at Montréal 26 June 1967). Son of sculptor Louis Philippe Hébert (1850-1917) and of Maria-Emma-Cordélia Roy (1856-1942). His childhood was spent as much in Canada as in France, his father having been commissioned to create a series of sculptures to adorn the facade of the Parliament Buildings in Québec City. From 1902 to 1911, he attended Montréal’s Conseil des arts and manufactures, taking courses from EdmondDyonnet (1859-1954), Joseph-Charles Franchière (1866-1921) and Joseph Saint-Charles (1866-1956). He also studied under WilliamBrymner (1855-1925) at the Art Association of Montréal, which later became the Montreal Museum of Fine Arts (see Musée des beaux-arts de Montréal). Adrien Hébert’s artistic career may be said to have begun in 1909 when he exhibited for the first time at the AAM’s Salon du printemps, a venue that regularly featured his works up until 1954. From 1910 to 1960 his paintings were shown at the annual exhibitions of the Royal Canadian Academy of Arts. 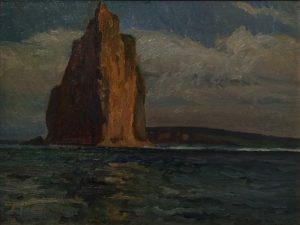 In 1916, he mounted a show at the Saint-Sulpice Library in Montréal with his sculptor brother, Henri Hébert(1884-1950), and in 1918 he also collaborated with his brother to publish Le Nigog, a review advocating modern literary and painterly aesthetics in opposition to the regional modes prevailing in Québec. His 1922-23 residence in France saw him painting Ardèche landscapes and Paris scenes, along with portraits of friends in a style recalling Cézanne. Returning to Montréal at the end of the summer of 1923, he taught design at the Conseil des arts et manufactures. After this date, his artistic style took on a more distinctive form as he discovered a painterly interest in the port of Montréal. What struck him about the port, in addition to the ships discharging cargo and the dockers working, was the beauty of the harbour’s architecture exemplified in the huge grain silos and in the footbridges connecting the wharves. Such structures afforded him the opportunity to compose highly formalized pictures that depicted the port’s dizzying activity translated by a pictorial evocation of sound and motion. Hébert’s love for the city manifested itself in his urban paintings: from this time and for many more years, he produced works which depict metropolitan streets, often those close to his studio in Sainte-Julie (now Christin) Street. These works capture images of pedestrians coming and going and of cars and trams travelling down rain-wet roadways or snow-swept streets. In March 1931 at the Galerie A. Barreiro in Paris, he exhibited 20 canvases representing his favourite subjects. That year the city of Montréal commissioned him to do a large-scale historical work on the topic of Jacques Cartier arriving atHochelaga in 1535. In 1941, he was elected to membership in the Royal Canadian Academy of Arts. Upon Henri’s death in 1950, Adrien moved into his brother’s studio on Labelle Street, a studio originally built by their father. During this period he painted the region of Chicoutimi encouraged by Armand Hébert, his nephew, whose job it was to promote the Saguenay. In 1953, Adrien received his third Jessie Dow prize, this time awarded by the AAM for his canvas S.S. Empress of Canada. The next year, upon his retirement from teaching for the Catholic School Board of Montréal, Hébert went to French West Africa, travelling on to France at the start of 1955. On his return he displayed works based on this voyage in his Montréal studio. He remounted the show in the Hélène de Champlain the following year. After the demolition of his studio in 1963, the painter installed himself in a house he bought in Westmount. Throughout his career, Hébert saw himself as an urban painter, even if he often worked on Belair Island, where his family owned a country property. A month after his death, Mayor Jean Drapeau presented one of Hébert’s Port-of-Montréal scenes to General Charles de Gaulle on the occasion of the latter’s visit to Expo 67. In 1971, the National Gallery of Canada organized and toured an exhibition entitled Adrien Hébert, Thirty Years of his Work, and in the summer of 1993, theMusée du Québec commemorated Hebert with an exhibition dedicated to his art.